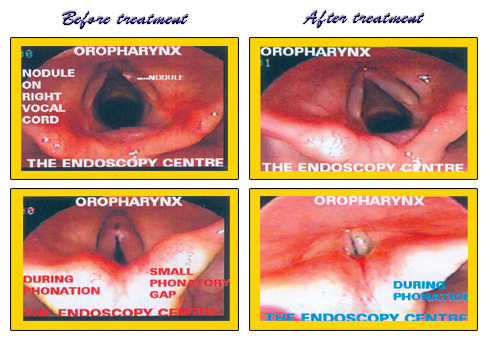 Vocal Cord nodules are very common ailment, which requires confidence in treatment. Here Dr.R.Gnanasambandam presents one a simple case history on vocal cord nodule from his case file. A twenty-nine years old Lady, Personal Secretary to a Psychiatrist at Bangalore consulted me for loss of voice since four months. Initially she had croupy cough with hoarseness of voice. She tried some antibiotics but loss of voice was progressive. Ultimately she was guided to a ENT specialist and suspected pathological vegetations. She was referred to an endocopist. Laryngoscopy revealed vocal card nodule on the right side. Her family members do not want take the risk of using a knife on her voice box. Naturally Homoeopathy was the choice for them among the other alternative systems. Fair, tall, thin and well built. The physical and mental make up of the patient; side affinity and sphere of action ultimately dragged my mind to think causticum as my choice of the remedy.I prepared high potency as the state of the disease is chronic with low susceptibility. She was very happy and continued the same medication for three months and then discontinued. Causticum is a well-proved trio miasmatic polycrest drug and its clinical efficacy is well proved in many pathological vegetations and neurological affections.